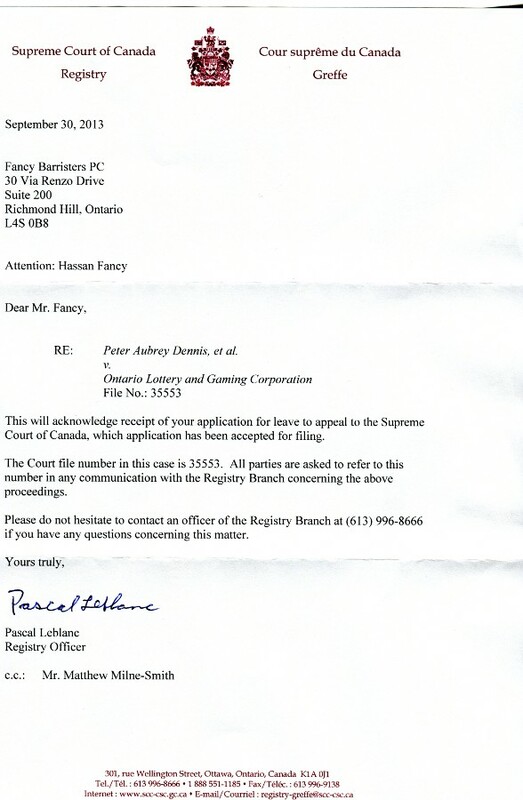 Statement of Claim: On June 9, 2009 Peter Dennis and Zubin Noble issued their Statement of Claim against the Ontario Lottery and Gaming Corporation. The Claim has since been amended, most recently on December 9, 2009. Download. Certification Motion: The Plaintiffs' motion for certification of their action as a class proceeding was heard by Justice M.C. Cullity of the Ontario Superior Court from January 13 to 15, 2010. The Honourable Justice M.C. Cullity's decision on the Certification Motion dated March 15, 2010. Read here. The Plaintiff's Notice of Appeal dated April 14, 2010. Read here. The Honourable Justice M.C. Cullity's Endorsement on Costs dated May 21, 2010. Read here. Divisional Court Appeal: The Court released its decision dismissing the Plaintiffs' appeal on December 2, 2011. 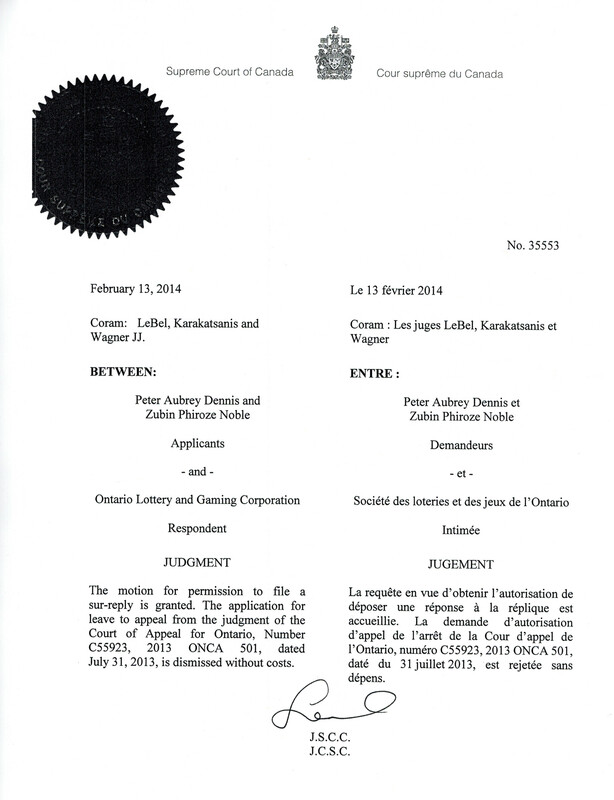 Two judges of the Court ruled in favour of the Defendants OLG, and one judge ruled in favour of the Plaintiffs. Read here. Court of Appeal for Ontario: The Plaintiffs were required to seek leave (i.e., permission) from the Court of Appeal for Ontario in order to appeal the Divisional Court's decision. They did so, and by order dated August 3, 2012, the Court of Appeal of Ontario granted them leave to appeal the decision. The Plaintiffs and OLG must now prepare and file their written submissions with the Court. The appeal will be argued orally before the Court on April 15, 2013 at Osgoode Hall, 130 Queen Street West, Toronto, Ontario. Court of Appeal for Ontario: The Court released its decision dismissing the Plaintiffs' appeal on July 31st, 2013. Read here. Supreme Court of Canada: The Plaintiffs are seeking leave to appeal (i.e. permission) from the Supreme Court of Canada to appeal the Ontario Court of Appeal's decision. Fancy Barristers P.C. is being assisted by Sotos LLP on the Application for leave to appeal to the Supreme Court of Canada. Adair Morse is no longer acting for the Plaintiffs or on the proposed class action. Supreme Court of Canada: The Court released its Judgment dated February 13, 2014. Read here. However, the Judgment did not address the alternative relief sought by the Applicants. Therefore, Mr. 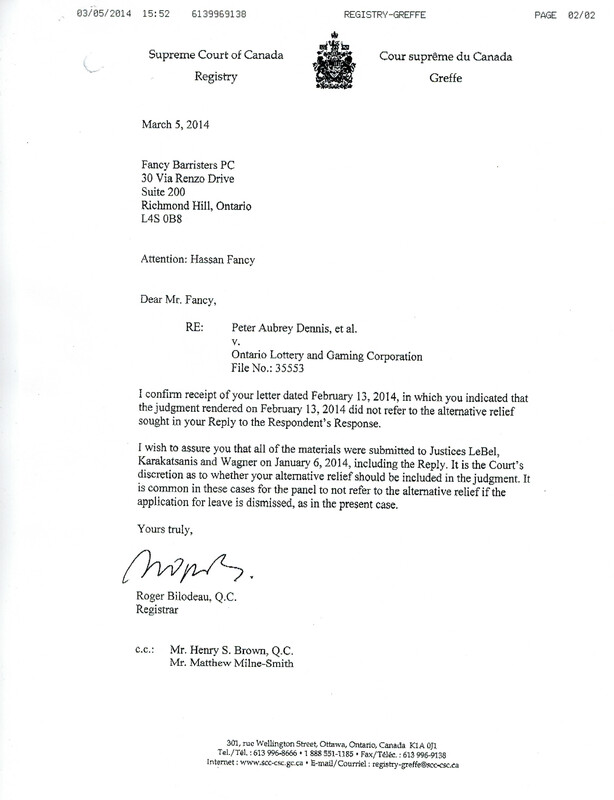 Fancy wrote to the Registrar of the Supreme Court of Canada on February 13, 2014. Read here. We are awaiting word from the Supreme Court of Canada on our letter. Keep the faith! Supreme Court of Canada: We regret to inform that the Court also refused relief on the grounds that the Judgment did not address our alternate relief. 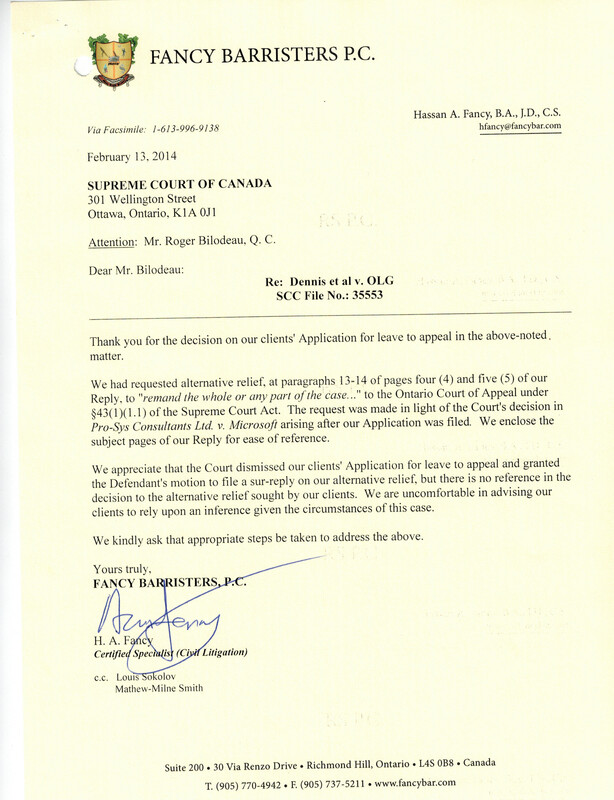 See letter dated March 5, 2014 of Registrar of the SCC. Read here. There is no further avenue of appeal in Canada and this brings an end to the prosecution of the proposed class action in Dennis et al. v. OLGC. However, you are always free to pursue the OLGC with your own resources, counsel and action. We understand too many are too ill, financially impoverished or facing other or additional obstacles such that the solution is good in theory but unrealistic in life. However, we remind you nonetheless. We cannot bring any further action and prosecute same for others against the OLGC given our own limitations, the complexity of same and the enormous expense of litigating against the OLGC in the Courts.